The UK release has a white cartoon-style drawing of the band on a black background (illustration by Michael Patterson / Candace Reckinger). The a-ha-logo plus the single title is printed in silver in the upper left corner. In addition, the picture sleeve offers a red speckled part of a rectangle in the lower section plus the (seemingly) haphazard drawing of a thick yellow crayon line across the sleeve. The reverse has a white background, more of the red speckles, one thick yellow crayon line (continued from the front), a large circled silver a-ha-logo plus "a-ha Train Of Thought" printed in black block letters in the centre of the sleeve. The single contains a remix (4:17) of the album version by Alan Tarney and John Hudson, in addition to the "original version" of "And You Tell Me" (1:56) produced by a-ha. As with many of the 7" singles, there are versions available with different coloured labels including white, silver, gold and blue metallic. As for "The Sun Always Shines On T.V. "-single another shaped picture disc was released (10,000 copies pressed) featuring the same tracks as the regular edition. The a-side of the disc shows a blue futuristic train, while the flip features a black and white group-shot (Morten, Mags & Pål). The a-ha-logo and track listings are printed in a light blue colour. An extremely limited number of uncut 12" picture discs exist which are test pressings. The regular UK 12" release has the same picture sleeve as the 7" except of course the additional information concerning the tracks. Once again Steve Thompson is in charge of the a-side U.S.-remix (7:03) while the b-side offers the tracks of the 7"-single. 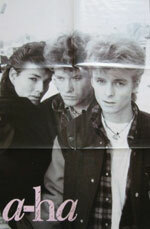 The 12" also comes with a limited edition poster (20"x30") featuring a black and white group-shot (identical to the b-side of the picture disc) with a pink a-ha-logo placed in the lower left corner. Most of these limited editions have "Includes Free Personality Poster W 8736 TW"-stickers. The 7" has a unique orange coloured "Reprise Records" label featuring a black "steamboat". Brazil: There is a four track promo only 12" with "Train Of Thought" and 3 tracks by other artists which comes in a WEA-sleeve. Germany: The limited edition 12" which comes with a free poster has a yellow sticker on the front on which "Includes FREE Poster" is printed in black letters. The first track is listed incorrectly as 8:31 which is the length of the dub version. The Japanese 7"-release picture-sheet features a truly unique multicolour band-shot (Morten, Pål and Magne) on a black background. 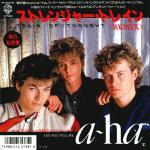 Track listings in English and Japanese are printed in red, white and black, while a white a-ha-logo is placed in the lower right corner. 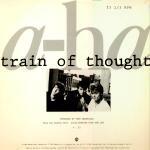 The reverse contains lyrics to "Train Of Thought" (in English and Japanese), a drawn portrait of the group plus additional Japanese information on the album including a minuscule picture. Some copies were distributed containing a fold-out questionnaire with a picture and advertisements for "45 R.P.M. Club" and "Hunting High And Low"-albums. The b-side listed as "And You Tell Me (Demo Version)" is identical to the "Original Version". The record has a "Reprise Records" colour patterned label, the a-side is a grey paper label with a light grey square and white and grey pattern, the b-side is of a similar design but has a red square and white pattern. The sleeve of the 12" is similar to the U.S. release, but with the usual additional text regarding its marketing in New Zealand on the reverse. On the front, printed above the title, is the text "SPECIALLY PRICED MAXI SINGLE". The featured "Extended Mix" is the one found on the UK 12", mixed by Steve Thompson. The 12" has unique orange coloured "Reprise Records" labels featuring a black "steamboat", similar to the Australian edition. The A-side features the regular version rather than the remix and the B-side of the 7" single is "Driftwood", the same B-side as the previous single "The Sun Always Shines On T.V.". The picture sleeve of the 12" has grey text and a-ha-logo instead of silver and the rest of the colours are sharper. The USA 12" has different tracks to the UK 12" , including the additional track "Dub Version" of "Train Of Thought" (8:35). [Item to be confirmed] The 12" promo comes in a unique custom sleeve. The front has a small black and white band-shot in the middle on an off-white background (picture is similar to the ones used for the later releases of "Manhattan Skyline"). 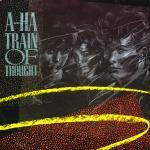 A huge light grey a-ha-logo is placed across the upper half of the sleeve, while "train of thought" has been written in smaller black letters just above the middle of the sleeve along with additional information below the picture. The reverse is just plain off-white with no information whatsoever. This release features the album version of the song (4:11) on both sides of the disc and plays at 33 1/3 R.P.M. This rare 12" is possibly a test pressing of the 12" single. There are 2 (heavy) one sided discs which come in a white sleeve. "k disc mastering" plus an address and contact number in Sunset Boulevard Hollywood, California is printed in grey in the top left hand corner plus "artist" and "client" printed in the top right. On this particular copy, "AHA" has been hand written in red ink next to artist and "WBR" next to client. The date 4-10-86 has also been written on the sleeve in black ink.